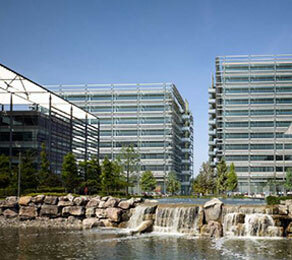 Setting new standards for the working environment, the award-winning Chiswick Park provides office space for more than 12,000 people, making it the biggest employment hub in west London. As a leading post-tensioning specialist, CCL designed and installed the suspended horizontal post-tensioned floor plates over 10 levels, a total of 25.089 m3, on building six in the Chiswick office park. The company also designed the reinforced concrete-core slabs and precast edge units. Hybrid Concrete Construction (HCC) was employed on this project. The combination of using precast and post-tensioned concrete allowed a faster construction programme and provided high quality finishes while still delivering flexibility and reduced costs. HCC maximised the benefits of both construction methods. In this case, the careful use of in-situ post-tensioned slabs with precast edge beams combined with precast columns simplified buildability and moved a large part of the site work to the factory, reducing the duration of the building process. A central stability stair core allowed the slabs to have free lateral movement, eliminating the need for anti-crack reinforcement. The Chiswick design philosophy was already established in earlier buildings and featured a repetitive layout, using precast concrete columns and precast edge beams which acted as permanent formwork. As well as providing an economic solution, the construction time was also minimised. The building received an ‘Excellent’ BREEAM rating.